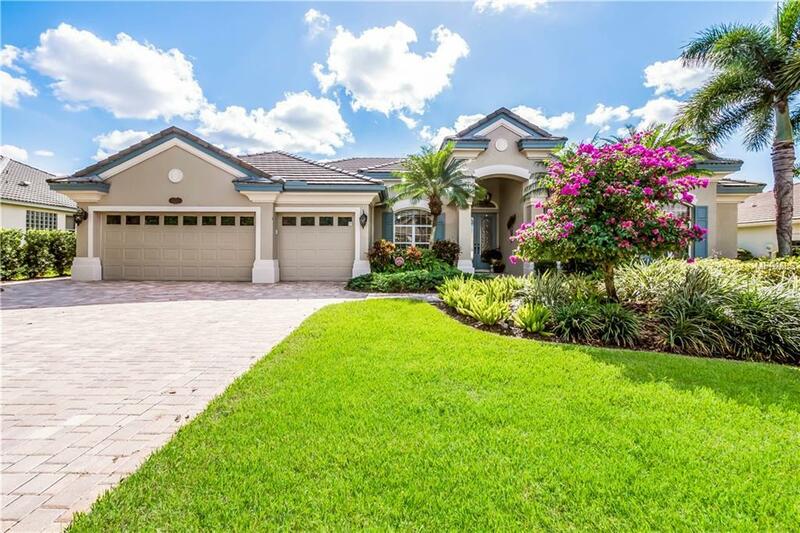 This custom Arthur Rutenberg pool home located in sought-after Turtle Rock on Palmer Ranch will delight you at every turn. The spacious 3,410 +/- square foot plan has all the right spaces and greets you with lush greenery views behind the ornate pool as you walk in the front door. The chefs kitchen features an oversized island, solid wood cabinetry, all new stainless-steel appliances, hanging pot rack, and a built-in work desk. The master suite is a true retreat, featuring dual walk-in closets, dual vanities with custom artisan sinks and countertops, a garden bath and walk in shower. Additional spaces include a 5th bedroom/office with built-ins and hardwood floors, oversized dining, living and family rooms, as well as three guest rooms. The three-car garage is a true showroom with custom epoxy floors, a granite-topped workbench, built-in storage and more. The pool was recently resurfaced with a pebble finish and has solar heating and lots of privacy. Other perks and upgrades include water conditioning system, NuFlow coated plumbing, newer HVAC units, outdoor landscape lighting, Lexan hurricane shutters and screens, new driveway pavers and path and much more! Youll have to see this fine home to believe it, schedule your private showing today! Additional Lease Restrictions Lease And Tenant To Be Registered And Admin Fee. See Page 45 Of Owners Manual.